There are years that ask questions and years that answer. So says the text on the card I received from my parents today for my 30th birthday. According to my mother, I am in one of those years that answers. At the moment, I still feel as though as I am asking a lot of questions. Where will this year of culinary school take me? Where will I be working? At the end of this year will I get to stay in New York or head back to Los Angeles? Or somewhere else? At least one question has been answered. Will I ever go to culinary school? Yes. In fact, I am doing that at this very moment. Every now and then I have to stop and remind myself that I am, in fact, doing that very thing. I have been putting this dream together for years and it is so easy to forget that I am finally here living it. I feel particularly grateful today. It is 1:30 in the morning and I am up late riding the adrenaline of a day that included the 30th anniversary of my birth and the practical and written finals for level one of culinary school. As we were waiting in the hall at school for our exam to begin, a man walked by and asked if there was a final going on. I glanced up and realized that Jacques Pepin was standing in front of me wishing our class good luck. “Cook from the gut,” were his final words as he continued down the hall after graciously posing for pictures with some of my classmates. Chef Pepin is a dean at FCI, but it’s not as though the man is there every day roaming the halls. It was, without a doubt, a celebrity sighting. I had already decided it was very apropos that I should spend the night of my 30th birthday chopping vegetables during the level 1 final, but Chef Pepin provided the icing on the cake for a notable evening. There is a bit more icing in my life right now as I lay in bed eating the slice of devil’s food cake I picked up on my way home from school tonight. Final or no final, a girl has got to have cake on her birthday. Lest you start thinking I eat cake every night, I am including the recipe for one of my more common evening snacks. By the time we finish with school and I catch the subway home, it is usually at least 11:30 pm. To help myself wind down from a busy and late night in the kitchen, I make a quick snack of pears on rye toast with ricotta and agave nectar. The pears and rye feel judicious after an evening that inevitably includes a butter-enriched something and the ricotta and agave sufficiently satisfy my sweet tooth to spare me yet another visit to Billy’s Bakery and a subsequent trip to the gym. If you are not a fan of the combination of savory and sweet, you can leave out the salt and cracked pepper, but I think it would be a mistake. The more pepper the better and make sure it is freshly ground. It is the perfect offset to the creamy ricotta and sweet agave. Toast the rye bread. Slice the pear thinly and place the slices on the rye bread. 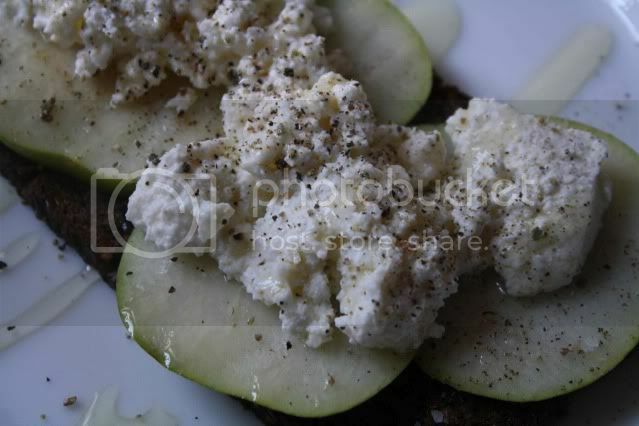 Spread the ricotta over the pear and sprinkle with salt and pepper. Drizzle the agave nectar over everything. THAT IS AWESOME. If I saw Jacques Pepin, I think my heart would dive right into my stomach. I would be a bumbling idiot. It is so symbolic that you saw him. I hope your test went well! And Happy Birthday! Here's to many more. May the answers be the right ones, even if they're not the ones you want to hear. I am so proud of you it hurts. You inspire me more than I think you know. Happy birthday! Congratulations on finishing your first tests. What a thrill to see Jacques Pepin! Plus, the thought of fresh ricotta is making me very happy right now. Yum. What a wonderful idea that is, years that question and years that answer. I wish you many answers in the year to come, answers you'll be happy with a decade or two from now. Happy birthday! Congratulations on making the leap toward following your dreams. Age 30 isn't that late -- Julia Child didn't find her calling until she was 36! I'm so proud of you Jess. I am truly inspired. Mmm that sounds like a delicious evening snack. I would never have thought of that combo. But then again, cake is good too. Happy birthday! Happy belated birthday Jessica! It was indeed quite special to meet a legend. I am proud of you for taking this risk, I have very good feelings about your future. Happy 30th, I just went through that this year as well. "Cook from the gut" is pretty intense and helpful motto to live by. I hope you are going to write a book about thse experiences! A memorable birthday. Drink it all in. WOW! You inspire me. I'm a new reader and i got hooked the moment i read you were attending Culinary School. I realised i wanted to attend culinary school and become a chef 2 years ago. During my 2nd last year of high school. Now that i've graduated, I really wanna attend culinary school but we have none here in Dubai! I hope i can become like you and finally ONE DAY attend a good culinary school! Till then keep posting recipes and i will learn as much as possible. Thank you for blogging! Amazing info really appreciate you sharing. Thank you for sharing excellent informations. Your website is very cool. I’m impressed by the details that you have on this web site.